We all know street art/graffiti is not a new concept. It remains an underlying strain on many urban centres around the world, with people always debating on whether it is a real form of art or vandalism of public/private property. Personally, I think that most forms of street art are positive influences on their surroundings, often turning ugliness into beauty and expressiveness. This summer in particular, I can't seem to get it off the brain. There have been a few wonderful movements in the way of street art which I feel the need to compile into a nice little area here. Both Toronto, where I live, and Montreal, where I just visited, have excellent examples of street art that improve their cities and make life a little more creative. 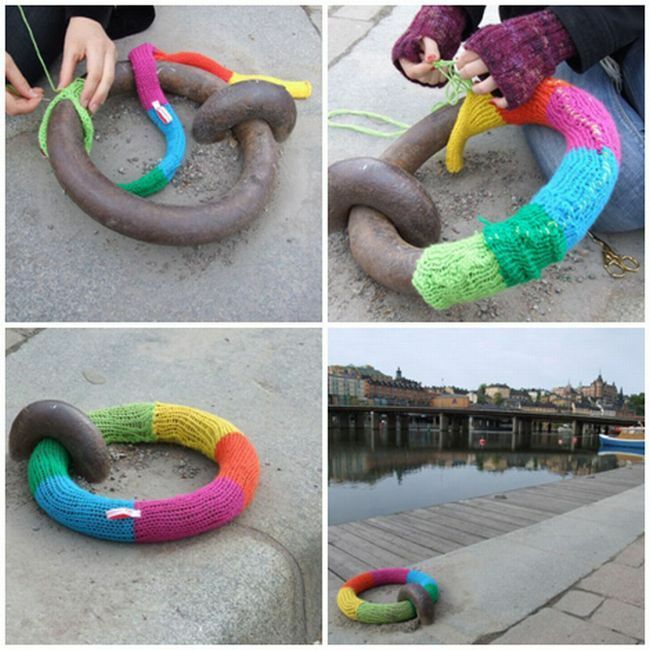 Guerilla knitting is one of my favourite kinds of street art. 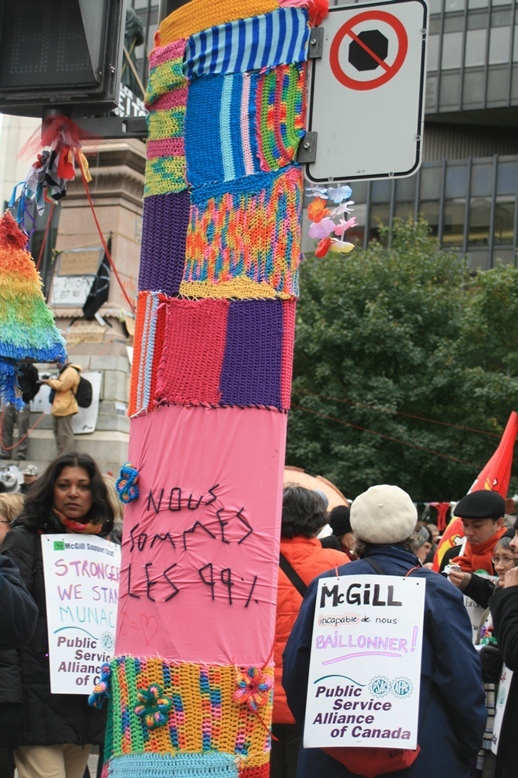 People literally knit pieces of cloth right onto fences, hydrants, bicycle stands, trees, whatever. One of the reasons that this kind of street art is wonderful is that the process takes rather longer than spraying a tag onto a concrete wall. You really have to commit to the work you are doing, and give off an "I don't give a crap!" attitude while you work. I was extremely excited to see an example of this near Sherbrooke subway station in Montreal. Some of them (such as the examples below) are politically driven and serve as a form of peaceful protest for various issues. To see more about this phenomenon in Montreal, check out this link. I also saw this done at the Melk Abbey in Austria (see below) this summer, but it was in a secluded area and there were other art pieces nearby so I think it was probably commissioned rather than just made for the sake of itself. Also in Montreal was an ALARMING amount of murals. I stayed at a friend's apartment in Plateau Mont Royal, and there was a mural in sight no matter which direction you were facing. And all of them were beautiful. 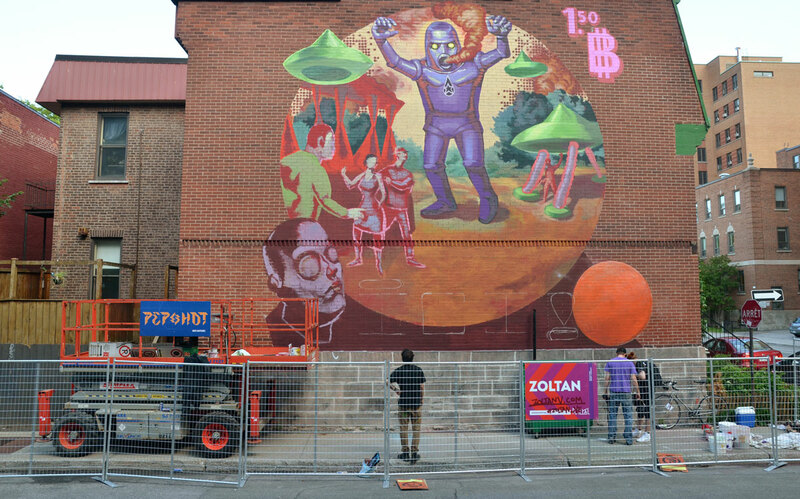 Montreal is a very art-forward city, and even holds a Mural Festival every year in June. Unfortunately I was there in the beginning of August, but the murals are (semi)permanent and can be viewed at any time. I get the feeling that the area I stayed in was particularly mural-esque, but who can say. See? Beautiful! 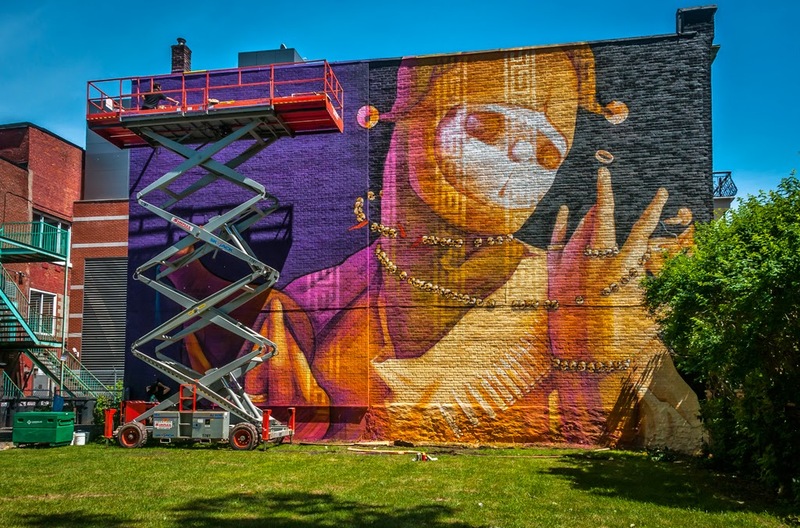 The website for the Mural festival is particularly interesting in and of itself. Check out the map page in particular. It's a little buggy but really cool to interact with. While I do believe that Montreal is way more creative as a city than Toronto, we all know that Toronto has some interesting public art. Take the Graffiti Alley for example. Located on Rush Lane between Richmond and Queen (East of Portland), the Alley is an envelopment of culture and colour. While the alley is wonderful, I need to note that the murals around Montreal are EVERYWHERE. Many of the beautiful murals painted around Toronto are eventually covered over for various reasons, so having a dedicated place for them makes sense. But on the other hand, why are we holding back a driving force of creativity when we could be changing our way of thinking to allow murals and graffiti and street art into every nook and cranny of the city? Toronto is cracking at the seams in some neighbourhoods, and some nice public art would rejuvenate those cracks tenfold. Let's look at another city similar to Toronto: Seattle. 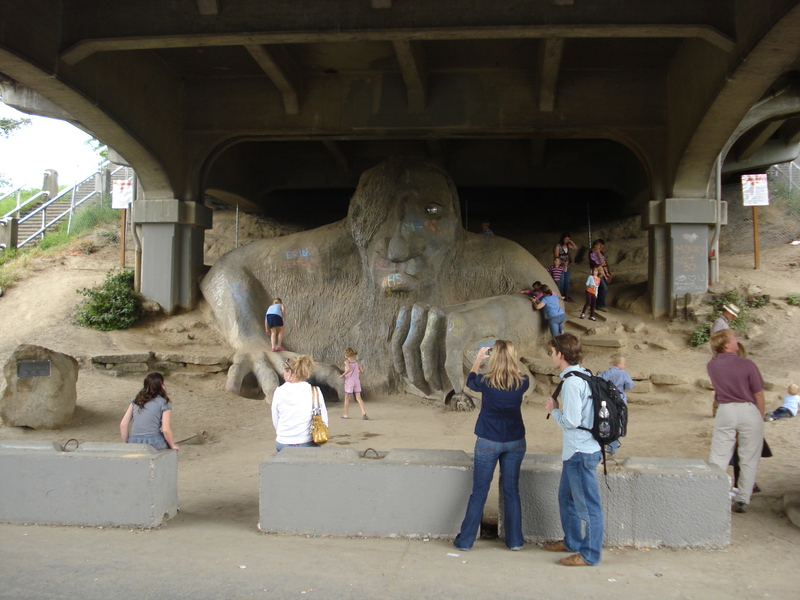 You may have heard of the Bridge Troll or the Gum Wall, both of which are amazing examples of public art. Seattle is also home to a sprawling landscape of intriguing graffiti. I like the way that the culture and creativity of Seattle's citizens isn't limited to any specific area (or even medium). The art and beauty simply exist everywhere. 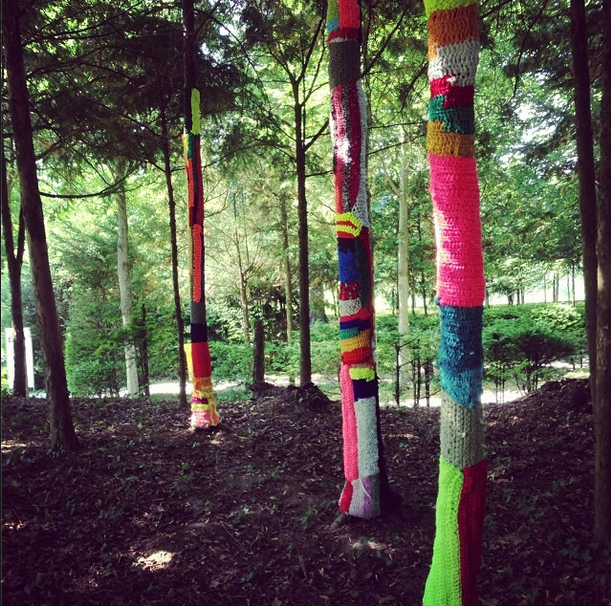 Speaking of existing everywhere, have you heard about site-specific street art? Circling back to those oh-so-specific cracks in the pavement: why not paint a pair of eyes peeking out of the crack? 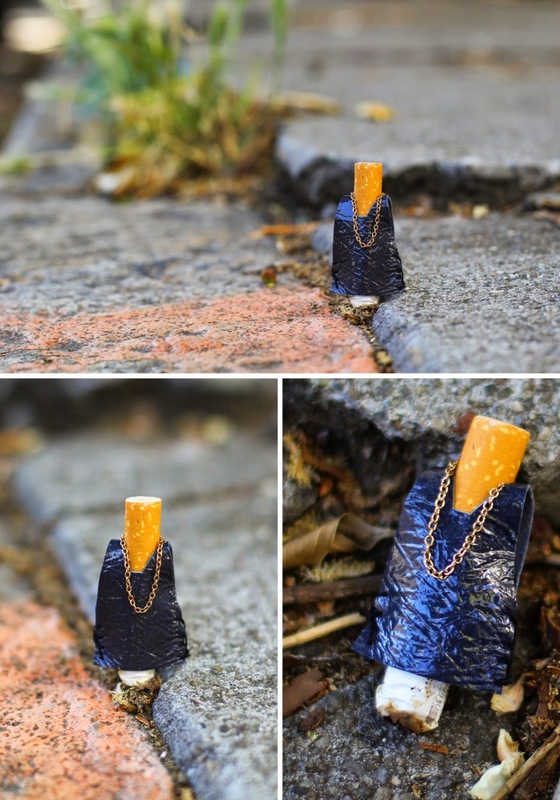 In that fashion, some very cheeky street art is popping up all over. The following examples come from UK street artist JPS. And a bonus: a picture from my angsty teen years. The graffiti underpass circa 2009. I will have you know that this picture was a very popular profile photo on Facebook for a solid three months. While I am sure that there are beautiful examples of street art in and around Toronto that are just waiting to be discovered, I must take issue with the fact that these places are hard to find. The artisans of Toronto must come together and assert their power! And as a bonus, my last example of interesting street art isn't really street art at all. It just happens to be art found on the street. 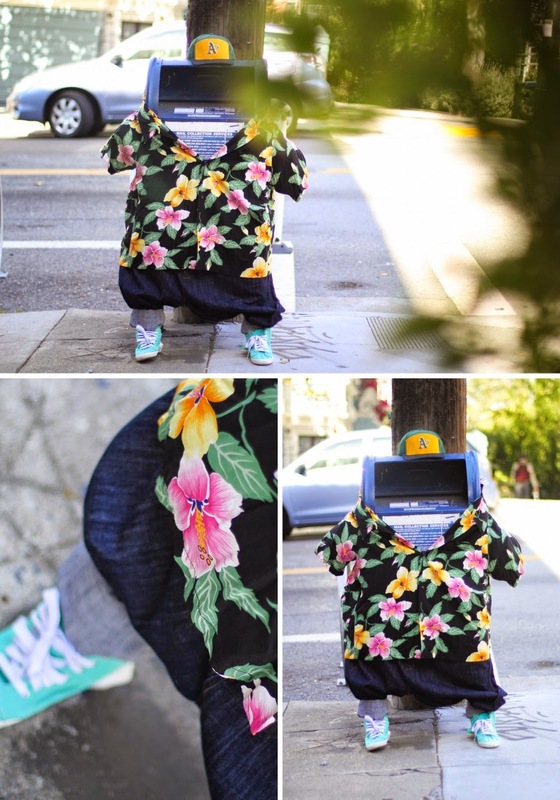 Designers Isla Bell Murray and Jessica Saia have taken a delightful spin on your average public art piece by literally dressing various different objects found on the street. Examples: a mail box, an orange pylon, and a tree. And their puns are maybe (probably) the best part of it all. View more of the collection here. I told you this last post was a bonus. Those puns just slay me. So if I were to wrap up this post with a nice neat bow, I would urge you to take a piece of your neighbourhood in need of some TLC, and use your creative prowess (or lack thereof) to beautify it into something everyone can enjoy. 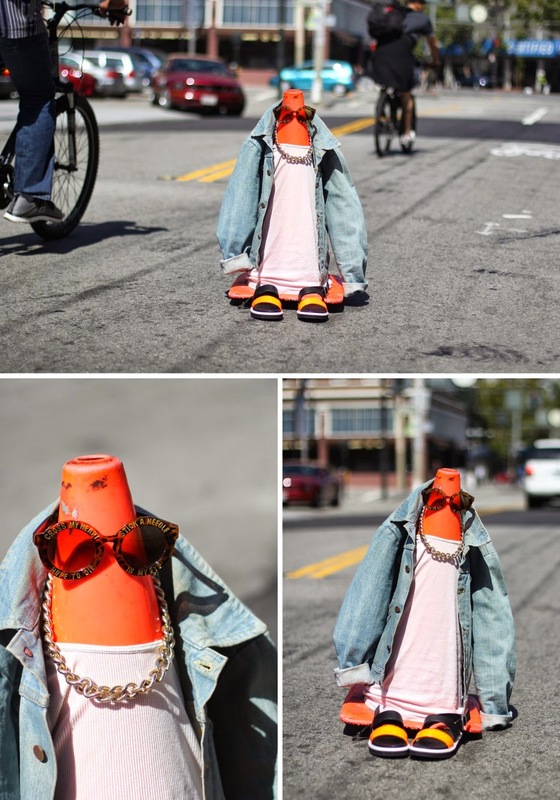 Although I think it might be best to leave the orange pylons unclothed, since they have an important job to do. You know, keeping cars from crashing. That sort of thing.